Delicious soft and chewy bakes, made from 5 of the finest wholegrains and choc chips. With proven slow release carbohydrate, as part of a balanced breakfast. This pack contains 5 individually wrapped Soft Bakes. Rich in Cereals, Source of Fibre, Source of Vitamin B6 and Folic acid, Magnesium, Iron, Made with wholegrain. Suitable for vegetarians.5 Wholegrains, Gently Baked At belVita, we're passionate about breakfast biscuits. That's why we worked in harmony with our farming partners to source 5 of the finest wholegrains. Baked together through our gentle baking process, these selected and nutritious grains are transformed to become delicious, soft and chewy bakes with proven slow release carbohydrate, as part of a balanced breakfast. Rich in Cereals, Source of Fibre, Source of Vitamin B6 and Folic acid, Magnesium, Iron. Made with wholegrain To get your day off to a good start, try a balanced, yet absolutely delicious breakfast with belVita. 4h slow release carbohydrates1 1belVita Soft Bakes with proven slow release carbohydrate, as part of a balanced breakfast. 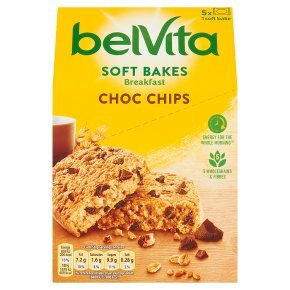 Energy for the whole morning2 2belVita Soft Bakes have a high content of slowly digestible starch, which is a slow release carbohydrate. Consumption of foods high in slowly digestible starch raises blood glucose concentration less after a meal compared to foods low in slowly digestible starch. 1 belVita Soft Bake (for slow release carbohydrates) + a plain dairy product (for your calcium intake) + a fruit (for vitamins) + a tea or a coffee (for your hydration) It will provide you 20%-25% of your daily needs as per nutrition recommendations.